Baby carriers and sling are great both around the house and when out and about. At home they give you the freedom to work around the house or to comfort your baby if he wont settle. And when heading out, they are a great alternative when a pram or pushchair would be impractical. There are two main types – baby carriers and baby slings. 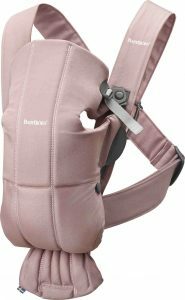 Classic front facing baby carriers are padded, structured, and fasten around the body with plastsic buckles and adjustable straps. 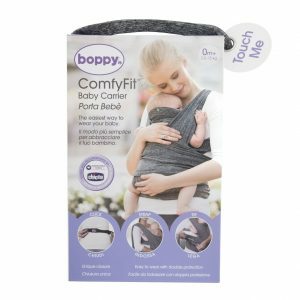 They are suitable from birth onwards but you must be careful to ensure that the carrier you choose supports your baby’s head, neck and back and is fully adjustable. The modern baby sling or wrap has been borrowed and adapted from predominantly African and Asian cultures, where mothers carry their baby for most of the day. They are designed for you to carry baby in a position comfortable for you, for example on your hip or front, and are therefore very flexible to use. They generally don’t have as many straps, poppers and zippers as a baby carrier but you do have to be bit more careful about using them, particularly in relation to ventilation and baby position. As with all baby gear, there is a dazzling array of all types of carriers and slings out there, and it can be tough to find the right one to suit you, your baby, and your family’s lifestyle. It needs to be comfortable, convenient, flexible and safe. This is one of those purchases that you should definitely try before you buy. Here are some of our favourites, all of which successfully straddle the divide between structured carriers and flexible slings and wraps. Plenty of mums love the closeness and custom fit of a traditional wrap but using them safely and comfortably can take a bit of practise. This stylish baby carrier has the best of both worlds with the soft fabric comfort of a wrap but with some of the structure of a carrier to ensure baby is correctly supported. It clicks around the waist, has a structured seat in the middle for baby to ensure correct positioning, and then the super soft fabric section has pre-formed shoulders making it super easy to take on and off. 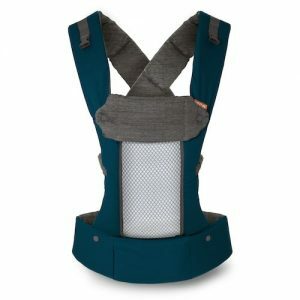 It can can be used as a parent facing up to 6 months and from 6 months outward facing carrier when your little one is ready to see the world (roughly 7.5 to 33lbs). Space-saving parents will love it, as it folds up in to nothing, is very lightweight and can is happily machine washable. The major selling point for this great carrier is that it genuinely grows with your baby from newborn (without an insert) right up to toddler hood (7 to 45lbs). This is largely beacause almost every part and strap is adjustable and customisable to baby, all of which can be adapted as they grow. The seat micro-adjusts from a newborn sized eight inches in width right up to 21 inches with the zip-on toddler inserts. There are two positions to carry baby, facing your chest or on your back and whilst there are quite a few straps to get used to, the Boba X is genuinely easy to use and very comfortable to wear. It also comes with plenty of really thoughful design features such as a detachable, hidden roll-up hood, a handy pocket in the wide padded waistband, and back/chest straps that can be adjusted up and down to make them easy to reach. 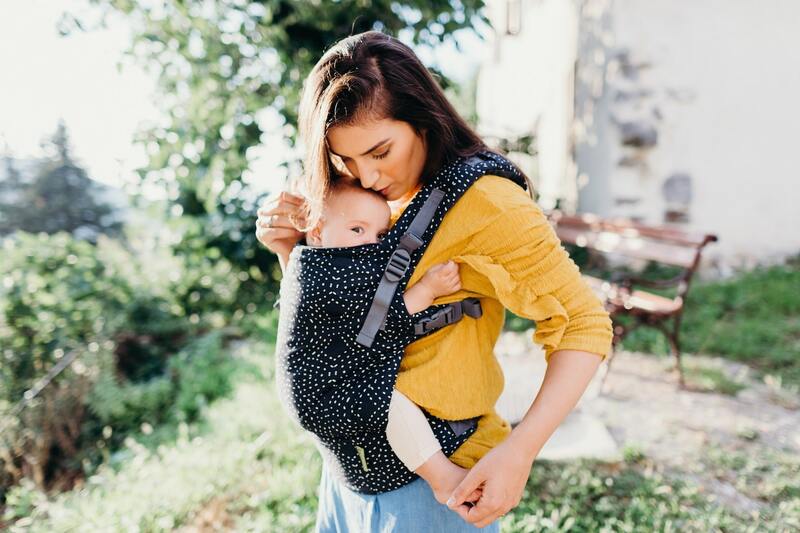 Beco will tell you that the big selling point for this carrier is the shoulder straps that can be worn ruck or crossed over the back, offering parents a super comfortable front carry position for both young infants and sleepy toddlers who enjoy extra cuddle time. And indeed this is genuinely a fine feature. But for a soft structured carrier, we also love the flexibility this one offers in carrying position – front facing-in, front facing-out, back and hip. All of those options do mean quite a few buckles, snaps and straps though, which can take a bit of getting used to. It comes with a newborn insert to boost young and small babies up to the right height, and there are a number of handy features such as a detachable hood and an all-season ventilated front panel which can be zipped up on colder days. This is a structured carrier with a difference. Designed especially for newborn babies, the simple design ensures it is exceptionally easy to put on and use. The tactile fabrics are gently on baby’s delicate skin and the egonomic design ensures that babys is carried in a natural position with their back in a gentle c-curve. It has great head support which is so important in the first five months when baby can support their haed unaided. You carry baby high on your chest and there is no fabric between you and baby so they can always hear your heartbeat. One particularly genius aspect of its design is that the entire front section can be unfastened to allow you to lift out your sleeping baby without waking. That alone probably makes it worth the price! It is designed for babies from roughly 7 to 25lbs so once baby hits about one year of age, you will have to upgrade.